Churchill was a devotee of Joseph Rudyard Kipling (1865-1936), the English poet, short-story writer, and novelist, who in 1907 won the Nobel Prize in Literature. Kipling’s majestic novels of the old Empire struck a romantic chord in the young Winston. Later they studded his books and speeches. There had been “greater poets and sages…more orthodox stylists,” Churchill wrote. But “no one has ever written like Kipling before and his work, with all its characteristics and idiosyncrasies…has been successfully imitated by none.”1 This essay can be read in full in the ISI edition of Churchill’s Great Contemporaries. Kipling’s other well-known poems included Mandalay (1890), Gunga Din (1890), and The Gods of the Copybook Headings (1919). He also wrote famous works of fiction, such as The Jungle Book (1894) and Kim (1901) and short stories, including The Man Who Would Be King (1888). Today, Kipling is regarded as a major innovator of the short story. Kipling and Churchill came together after the war as members of the Imperial War Graves Commission. Established by Royal Charter in 1917, the commission was charged with burying and commemorating dead and missing soldiers. As Minister of War in 1919-21, Churchill was its chairman. Kipling joined the commission mourning the loss of his 18-year-old son John, missing in action at the Battle of Loos in September 1915. Lt. Kipling was last seen stumbling blindly through the mud with a possible facial injury. His body was never found during Kipling’s lifetime. While chairman, Churchill attended one commission meeting, on 21 January 1919. Among its attendees was Rudyard Kipling. The poet wrote publicity for the commission and chose or composed inscriptions for its memorials. Headstones of the unidentified included the words, “A Soldier of the Great War—Known unto God.”7 Churchill was fine with that. 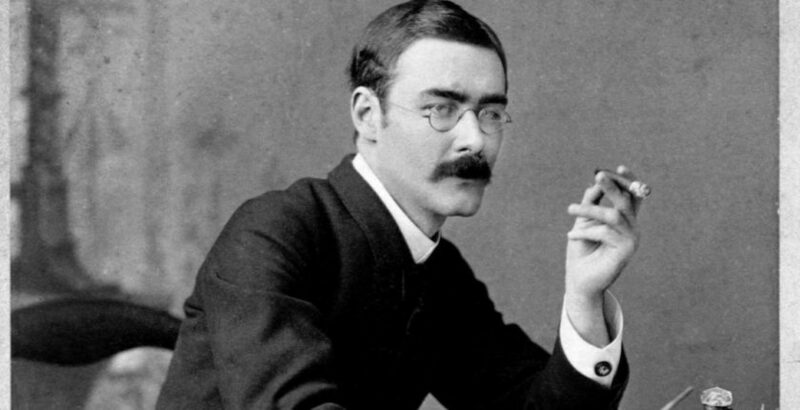 Rudyard Kipling died on 18 January 1937. A memorial dinner, to raise a scholarship endowment for the Imperial Service College, Windsor, for the sons of persons in the public service throughout the Empire. Addressing the throng, Churchill called Kipling “unique and irreplaceable…. The light of genius expressed in Literature does not fail with the death of the author. His galleries are still displayed for our instruction and enjoyment. But the magic key which could have opened new ones to our eager desire has gone forever. Let us, then, guard the treasures which he has bequeathed…. Although in my political actions I was often fiercely opposed to him, yet there never was a moment when I did not feel the surge of his appeal upon the great verities of our race and State. But what has always thrilled me most in Kipling was the occult power which he had to roll back the Time Curtain and bring the past to life again. We read a few pages in Puck of Pook’s Hill of unpretentious prose, and then suddenly with a gasp we are on the Roman Wall…. As Kipling had done in 1907, Churchill won the Nobel Prize for Literature in 1953. Speaking with reporters at Downing Street, he recalled that Kipling was the first Englishman to receive the Prize, and another was George Bernard Shaw: “I cannot attempt to compete with either of those. But I knew them both quite well and my thought was more in accord with Mr. Rudyard Kipling than with Mr. Bernard Shaw. On the other hand, Mr. Rudyard Kipling never thought much of me, whereas Mr. Bernard Shaw often expressed himself in the most flattering terms.”15 But the Old World was indeed passing away, and political differences were forgotten in Churchill’s veneration for a great writer. 1 Winston S. Churchill, Great Contemporaries: Churchill Reflects on FDR, Hitler, Kipling, Chaplin, Balfour, and Other Giants of His Age. (Wilmington, Intercollegiate Studies Institute, 2012), 420. 2 Richard M. Langworth, ed., Churchill by Himself: The Definitive Collection of Quotations. (New York: Rosetta Books, 2013), 9. 3 Winston S. Churchill [grandson], ed., Never Give In! : The Best of Winston Churchill’s Speeches (New York: Hyperion, 2003), 307. 4 Rudyard Kipling, The Collected Poems (Hertfordshire: Wordsworth Poetry Library, 1994), 605. If was first published as part of Kipling’s Rewards and Fairies in 1910, and published as a single poem in 1914. That year, to encourage Churchill, Violet Asquith quoted some of it to him: “I have just been reading ‘If.’ It’s a great poem, isn’t it?” See Martin Gilbert, ed., The Churchill Documents, vol. 7, The Escaped Scapegoat, May 1915-December 1916 (Hillsdale, Mich.: Hillsdale College Press, 2008), 1255 n.1. 5 Kipling, Collected Poems, 341-42. Churchill Archives, CHAR 28/125/30. 6 Andrew Lycett, Rudyard Kipling (London: Weidenfeld and Nicolson, 2015), 595. 7 The author thanks Andrew Fetherston, Archivist, Commonwealth War Graves Commission, furnished a copy of the minutes and other information on Churchill’s role, 21 May 2018. 8 Royal Society of Medicine Official Bulletin No. 49. Remarks by Churchill, 16-19; and Kipling, 25-26. Library of Congress. 9 Martin Gilbert, The Churchill Documents, vol. 12, The Wilderness Years 1929-1935 (Hillsdale College Press, 2009), 664. 10 Darrell Holley, Churchill’s Literary Allusions: An Index to the Education of a Soldier, Statesman and Litterateur (North Carolina, McFarland, 1987) 128-32. 11 Mary Soames, ed., Winston and Clementine: The Personal Letters of the Churchills (Boston: Houghton Mifflin, 1998), 368. The Kipling quote is from “For to Admire,” first published in Pall Mall Magazine, June 1894. See also Kipling, Collected Poems, 473-74. 12 Martin Gilbert, The Churchill Documents, vol. 13, The Coming of War 1936-1939 (Hillsdale College Press, 2009), 1512, n.1. 13 The Kipling Journal (Kipling Society, London) 60: 237, March 1986, 8-10. 14 Winston S. Churchill, Great Contemporaries (Wilmington: ISI Books, 2012), 420-24. Martin Gilbert, ed., The Coming of War 1936-1939, 845, n.1. 15 “Churchill Wins Nobel Prize, Puts Kipling and Shaw Higher,” The New York Times, 16 October 1953, 1. Mr. Glueckstein, of Kings Park, New York, is a writer and traveler in search of Churchill.